What about curating on social media? Signing off and toasting: To rocking your wellness blog with some high-quality curated posts. Content curation (as opposed to creation) is an awesome blog post format that you may already be using to rock your blog. In fact, it’s a great way to showcase the best information on any given topic. If you do it right, you can use it to show your audience that YOU are a hub of great information. Plus, it allows you to make connections with experts, and those who create the awesome content that you curate and share. And you can use the links you find to fill up your social media feed for a while too! 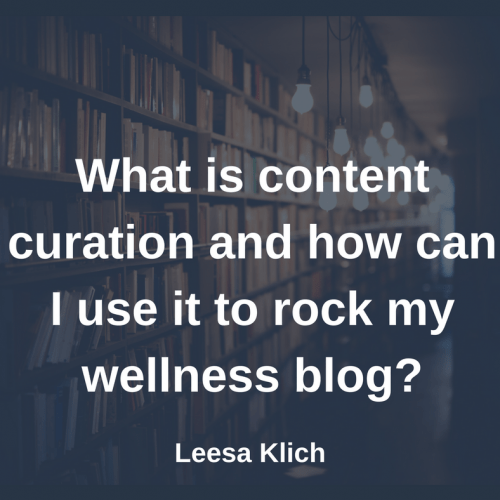 I’ll share some great examples of curated content in the wellness industry. Plus, I have some great tips so you can use it to rock your wellness blog. So, what is content curation? You can use it to create a new blog post without creating your own fresh content from scratch. It’s rounding up awesomeness and packaging it nicely for your audience (while only posting excerpts and linking back to the original sources). My favourite way of sharing awesome wellness and content marketing information is actually Twitter! Are you following me there? But, curating great content on Twitter doesn’t do too much for my blog. I have curated a nice selection of examples of recipe and wellness posts that curated their own content. (Is that curated squared???). I hope you can get inspired to pick and choose what you like to create your own curation. PRO TIP: Don’t copy and paste any more than a short quotation from someone’s website. You don’t want to create duplicate web content for them. Post just a short excerpt or quotation, and always ALWAYS link back to the original source. One of my favourite sites for awesome curated recipes is Greatist. They find a bunch of recipes on a particular food or meal, e.g. chia pudding recipes, and put them together in a beautiful way. Here’s one of my favourite posts that I keep coming back to for breakfast inspiration. It’s 36 Chia Seed Pudding Recipes That Taste Like Dessert. Short description of the recipe along with the link. It’s sorted by type of recipe: spice mixes, breakfasts, snacks, etc. Even though the post was originally published in 2015, I went and updated it in July 2017. To update it I checked that all of the links were still working, and also called out to my holistic nutrition colleagues to share any new turmeric recipes for me to include. Now that I’ve read this post, I want to see the movie “Wasted! The Story of Food Waste.” (Vimeo says it’s “unavailable in my region,” but I might be able to rent it with my Amazon.com account…). One of my favourite (and relatively new) monthly roundups is the Heath Communication Research Review by my health writing instructor and online mentor Michelle G.
In this roundup Michelle curates the best news and studies about how to best communicate health information. I also love the fact that when she links to studies, she mentions which ones are behind a “paywall” right in her introduction. Here’s an example from my friends, the Naughty Nutritionists. They asked a bunch of experts to not only tell, but show what’s in their fridges. Each contributor has their photo, bio, and links beside their info. It was a lot of work. A lot! And the end result is pretty freaking epic, if you ask me. I took the extra step to give every single expert contributor their own tweet. First thing is to make sure you have a great topic that you’re curating content about. What is your audience looking for, and how can you find the BEST info online to share with them? Second, make sure the content is high quality. It should be good enough for you to share with your audience and give a generous backlink to the creator. Always read through the post with a critical eye before including it in your curated post. Third, add your spin. Yes, you can just create a bunch of links like I did on my turmeric recipes post. And if I didn’t have a great intro and video I would have. Having said that, it’s nice to add even a couple of sentences as commentary and introduction for each link you include. Fifth, break the links up into sub-topics. You’ll see that in this post that you’re reading now, I talk about recipes, news, and experts separately. Sixth – I mentioned this before but it’s just so damn important that I have to reiterate: Only take excerpts and always give backlinks. Don’t copy any more than a short quotation, and always, ALWAYS, link back to the original source. Seventh – Use the amazing links you’ve found to fill up you social media feed for a while. Eighth, it’s a nice touch to give the peeps you’ve quoted a shoutout on social media so they know you love and linked to their awesome content. Especially if they didn’t knowingly contribute. It shows your appreciation, and helps to build a relationship with them. Creating awesome wellness content doesn’t mean you have to start from scratch every week! You can curate your favourite recipes, news, and even get experts to contribute! Curating wellness content can be a great way to build your brand by becoming a hub of the best information in your niche. It’s a great way to mix up the format of your posts from week-to-week. What do you think? Do you already curate your own wellness content? How well does your audience love it? Are you inspired to create a curated post in the near future? I’d love to know (in the comments below)! Feel free to post your link! Thanks, Leesa! Here’s a curated recipe list I created: https://sparkwellness.ca/carrots. I’m double checking that I followed all of your great suggestions! Excellent Jenna–Curated recipes are my fav! I love your “carrots for breakfast” category!